The sun came out for my birdwatch, after days of cold grey. The bird sound is spring-like. Spotting and recording the birds is the easy bit – I hope to sketch them as I see them during my count, which I find is quite a challenge. Particularly the Nuthatch as it sneaks off behind a branch, or the far side of the feeder, so most sightings are beak, or tail flick. 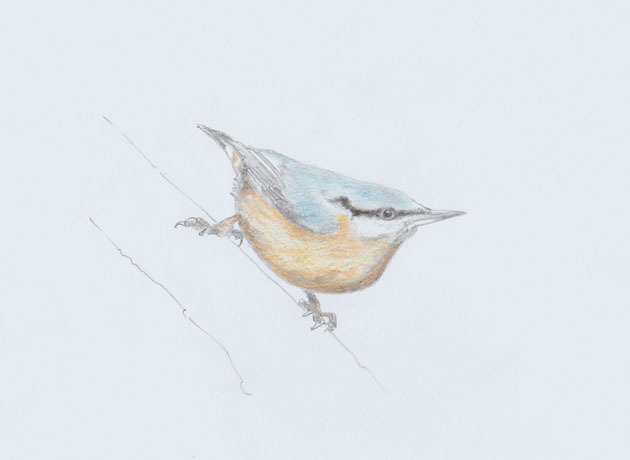 A second Nuthatch joined me on my Big Garden Birdwatch and I got much better views. Coloured pencils were used for the drawings – usually I sketch with ordinary pencil, and prefer it for getting soft graduation of tone which gives a more three dimensional feel to my drawings I think. 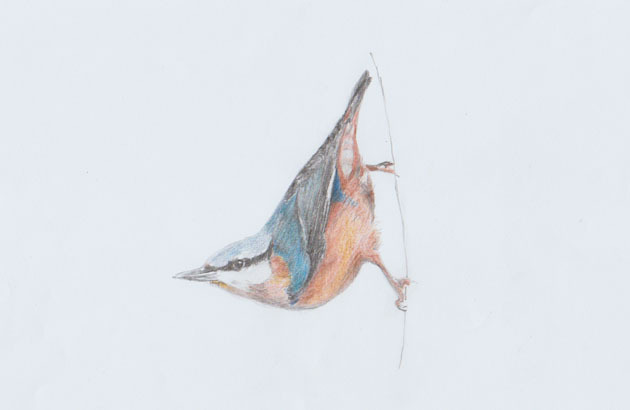 A Treecreeper featured in my birds recorded, but it was much too quick for a recognisable sketch. However, I did get a photograph, so I could draw from that at a later stage perhaps. The idea really was to quickly draw what I saw. What an enjoyable couple of hours and a thankyou to all the birds who made an appearance, especially this year, the Nuthatches. Exquisite sketches, Jennifer … and what a good idea to sketch as well as count! I’m so pleased you threw a link back to this page. Hello Caroline – I’m looking forward to a few weeks time when I’ll be sketching and counting again. It will be interesting to compare the Nuthatch numbers.